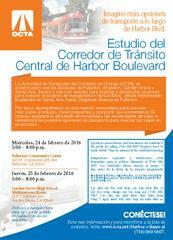 The Orange County Transportation Authority is partnering with the cities of Santa Ana, Garden Grove, Anaheim and Fullerton for the Central Harbor Blvd. 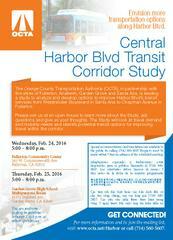 Transit Corridor Study to envision the future of transit on Harbor Blvd. Harbor Blvd. provides a vital north-south connection linking residents, businesses, schools and visitor destinations and has the distinction of being the busiest bus routes in the County. More information can be found by visiting www.octa.net/harbor and an online survey will also be available starting February 24.